Monday October 19th was election night in Canada and millions of people turned up to the polls to vote and elect a new government. But the story doesn’t end there. Once votes were cast, Canadians turned to the Canadian Broadcasting Corporation/Radio-Canada as their trusted source for election results. CBC/Radio-Canada decided to build a responsive app that would work across mobile and desktop devices and provide real time results in both English and French. To achieve the high performance, large scalability requirements (hundreds of thousands of request per second) and to provide a modern multi-channel application CBC/Radio-Canada needed a flexible and powerful cloud partner. CBC/Radio-Canada decided to turn to Azure and specially leverage App Service environments to host the APIs powering the application. Using Azure App Service environments CBC/Radio-Canada was able to scale their infrastructure across three different geographical regions close to 1,300 compute cores to serve over 3.6 billion requests over a period of six hours with peaks of over 800K requests per second. In preparation for the app going live CBC/Radio-Canada did diligent load testing and functional testing of the application burning through 10 million user minutes of Visual Studio online load testing. This helped raise the confidence on the app and understand how the platform behaved under load as well as validate that the load predictions would be met by the infrastructure. This preparation resulted in an uneventful night for the application and praise for the platform and site on the CBC/Radio-Canada social feeds. Long live technology. 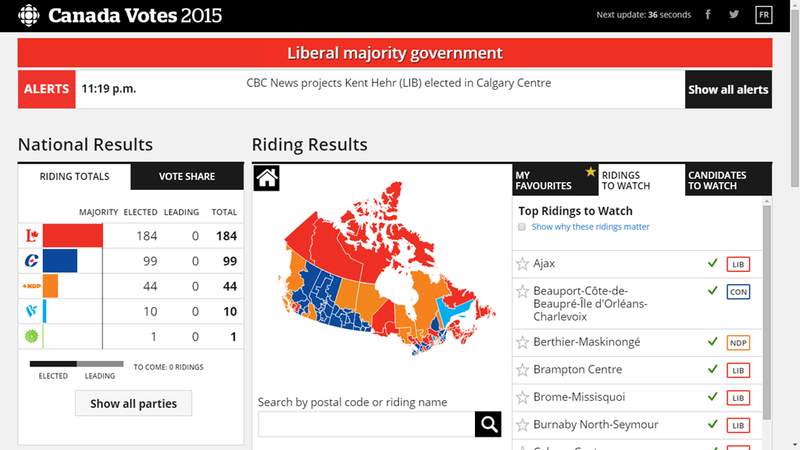 Radio Canada has really exceeded itself for the dissemination of election results. This website is on point! Beautiful platform, all in real time. Congratulations [ CBC / ]Radio-Canada !! Azure App service environments provide the ability to host extremely high load applications on dedicated infrastructure leveraging all the feature and functionality you are already familiar with from Azure App Service. Click here to learn more about Azure App Service Environments. Load and performance testing should always be part of your development process, Azure makes it easy to load test your applications directly from the Azure preview portal, click here to learn more. If you are not familiar with Azure App Service you can give it a try here, no credit card or sign-up process required.